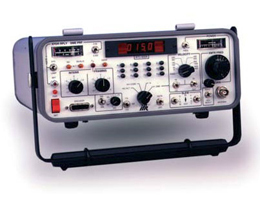 The ATC-600A is a handy test set developed to simulate the ground station or airborne environment required to test Modes A and C transponders. The ATC-600A satisfies most recent ARINC specifications and FAA regulations regarding pilot's code and encoded altitude tests and SLS, transponder receiver sensitivity, percent reply, and transmitter power, frequency. For DME testing, the ATC-600A comes with PRF measurements, precise range, power and frequency and velocity simulation.